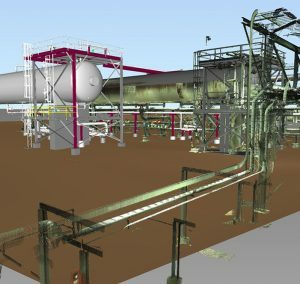 3D Laser Scanning is a relatively new, but also revolutionary, surveying technique. 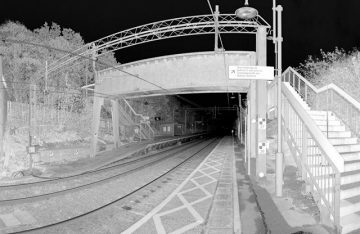 A laser scan yields a digital data set, also known as a “point cloud” made up of very dense points. Each point has 3-dimensional coordinates. This point cloud is then seamed together with other point clouds using control points or surfaces common to the two point clouds. This process gives the produced point cloud the same relative coordinate system. Then measurements may be taken within a CAD or GIS program using the combined and calibrated point cloud. Remote Sensing techniques have been used for many years – aerial photography which lead to photogrammetry, reflectorless total stations, horizontal photogrammetry, and aerial lidar. 3D laser scanning is a further development of aerial lidar. It uses the same lidar technology from a ground based scanner. Therefore, the uses are different for ground based laser scanning. Ground based can also be divided into two categories – stationary and mobile. Mobile laser scanners are mounted on some type of vehicle and driven along a route collecting data points. A stationary laser scanner is moved around an object and setup at different points to complete the capture. Need expert advice? Call (844) 486-SCAN (7226) now, we're glad to help! 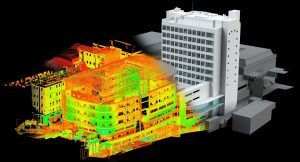 This new technology in topographic mapping, 3D laser scanning, comes to the aid of any engineer, architect and other specialist in the field, offering the ability to access accurate data using 3D laser scanning services at any time without the need for another field visit. From architecture, historical monuments and archeology to buildings, transportation infrastructure, forensic and insurance surveys, the laser scanning method, with millimeter precision, allows the creation of a faithful digital copy of any building or object. The 3D scanning process involves, in the first phase, collecting field data with a professional grade 3D scanner. The results of scanning the surface is rendered into a “point cloud” – a dense network of points that can be seen as a 3-dimensional picture where each pixel is defined with 3D coordinate points (X, Y, Z) in their natural color. 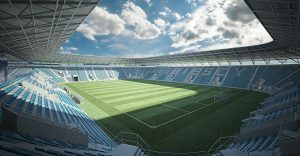 Subsequently, the digital scan made as a result of the 3D scanning process can easily be used and processed by architects, design engineers, and other specialists. How Does 3D Scanning Help You on Your Projects? You benefit from the best time / price ratio due to the efficiency of 3D data, but also because it reduces the delivery time of the architectural materials required for design. 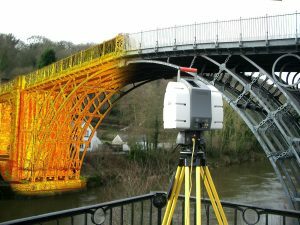 Whether it’s 3D laser scanning of a new or old building, road construction or a historic landmark, our laser scanning team of topographers and 3D scanners ensures the correct and efficient design of any project by laser scanning in 3D. Also, thanks to the professional equipment used by our surveyors, you will receive precise high-resolution information, which can be used in other applications. In addition, you have the opportunity to get expert advice throughout the project. For any information or details about 3D scanning, 2D or 3D models, make a request using the form below at any time and we will be delighted to speak to you. Laser Scanning is also sometimes referred to also as Lidar (Light Detection and Ranging). There are really three different ways to collect the points that make up a point cloud – terrestrial, aerial, and mobile. So, you’ll often see Laser Scanning, Lidar, and 3D Scanning used interchangeably. A terrestrial laser scanner sits in one position and scans as far as the sensors reach and then we move it to another location to get a different angle of the same object. This series of instrument setups are then pieced together to form one map. We can also mount a laser scanner on a vehicle and make it “mobile laser scanning.” Placing the laser scanner in an aerial vehicle (manned or unmanned) makes it “aerial laser scanning.” Control points are important in all the different ways of collecting points. Without these precise points, the point cloud would be just a cloud related only to itself. All of these scanning methods use ultraviolet, visible, or near infrared light to image objects. Wavelengths of the lights vary from 250 nanometers (1×10-9 m or one billionth of a meter) to 10 micrometers (1×10-6 m or one millionth of a meter). We listen to your plans for the data and help you decide on the best way to accomplish your goals. The data acquisition may be done by you or others. We can consult with you to show you how, or we can get the work done for you. This includes secure storage & sharing in a safe environment. Insuring the data meets the project objectives and quality needed. This step produces the topographic drawings or 3D models and other details needed by the client.